Game drives are conducted in 4 x 4 vehicles, accompanied by highly experienced driver guide. All members of the “Big Five” (lion, leopard, African elephant, African buffalo, and Black Rhinoceros) are found in the Masai Mara. Hippos and Nile crocodiles are found in large groups in the Mara River, next to the camp. In addition, hyenas, cheetahs and jackals can also be found. Hammerkop Migration Camp gives you the best seat in the house to watch the great migration. This is the annual migration of wildebeests, gazelles and zebras on Kenya’s Masai Mara National Reserve and Tanzania’s Serengeti Plains. These spectacular animals are driven by an onward search for fresh grass, and they follow the rains back and forth between the two countries. 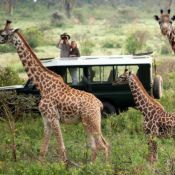 In July the animals cross the Grumeti Game Reserve in Tanzania and move towards Kenya’s Masai Mara. However, in order to reach this lush new source of food, the herds must make their way across the treacherous Mara River where hungry crocodiles wait. These huge predators and steep embankments, along the Mara River, make it a very dangerous life and death event. Once across, the danger shifts to other predators such as lions, leopards, and cheetahs. 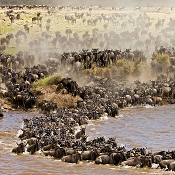 Rated as one of the world’s most spectacular events, the great migration offers you an opportunity to see millions of wildlife. 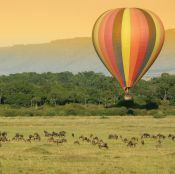 A balloon flight will allow you to hover over Masai Mara as you seek out lions, giraffes and hundreds of other creatures in this bountiful ecosystem from a unique aerial perspective. The unique vantage point provided by a balloon safari will allow you to appreciate the stunning African landscape from a totally new view. The adventure begins just before dawn. Departure is from a perfect natural launch site near the camp.